April is Financial Literacy Month—30 days dedicated to improving people’s personal finances. In honor of those 30 days, Money Management International created a 30-step path to financial wellness. 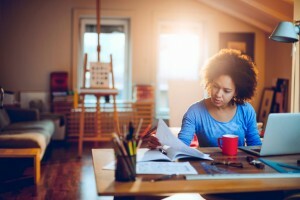 Whatever the state of your personal finances, getting started with those 30 steps can help bring you to the next level. In addition to following a general path toward financial health, there are certain life events that require sound financial decisions. One of the biggest is the decision to pursue higher education—whether that’s a short-term training program, a college degree, or even graduate school. 2) Education is expensive. Even if you don’t personally know someone with a large debt due to school or college costs, you’ve probably read plenty about the issue. According to Bloomberg News, Americans are now collectively $1.3 trillion in student-loan debt. 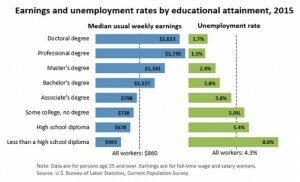 Both of the above are true: furthering your education has the potential to boost your earnings AND put you in debt. The education-planning challenge is to get the most benefit for the lowest cost. So how do you do that? Get started by researching both career fields and any schools you are considering. See which careers are growing the fastest. Check out average wages or salary for your career of choice. Get more career details for careers you’re considering. Visit College Scorecard to see the average annual cost for the school you want to attend. You’ll also be able to see students’ typical total debt amounts, monthly loan payments, and salaries after graduation. Look at all of the information provided on this website to help you figure out if the school would be a good investment for you. Find more tips and information on paying for school.